We did it, New West! New Westminster has a great LGBTQ Pride scene, led by (obviously) New West Pride. 2015 Pride Week is coming August 8th to 15th, capped with a huge street party on Columbia Street on the 15th. New Westminster is putting in curb extensions around town, with the most-recent being installed at Fourth Street and Carnarvon Street. So what do these two have to do with each other? In a discussion regarding these curb extensions, City Councillor Patrick Johnstone said, “I actually hoped there’d be a paint treatment on the slope as well to make the crossing more visible from below.” He’s right, it’s difficult to see the crosswalk when you’re driving up Fourth Street. And while he’s probably thinking of an X marking (like in Figure 7.46), I’m thinking we can do that and go one step further: Pride crosswalks. They’re getting pretty common these days (Vancouver, Victoria, Philadelphia for example). To help celebrate Pride in New West, let’s make one (or two!) happen in our little city. Fourth and Carnarvon would be a great place for a four-way Pride crosswalk (similar to Victoria’s). It would definitely make the intersection more visible to drivers, and provide a nice focal point for a pair of relatively quiet streets downtown. 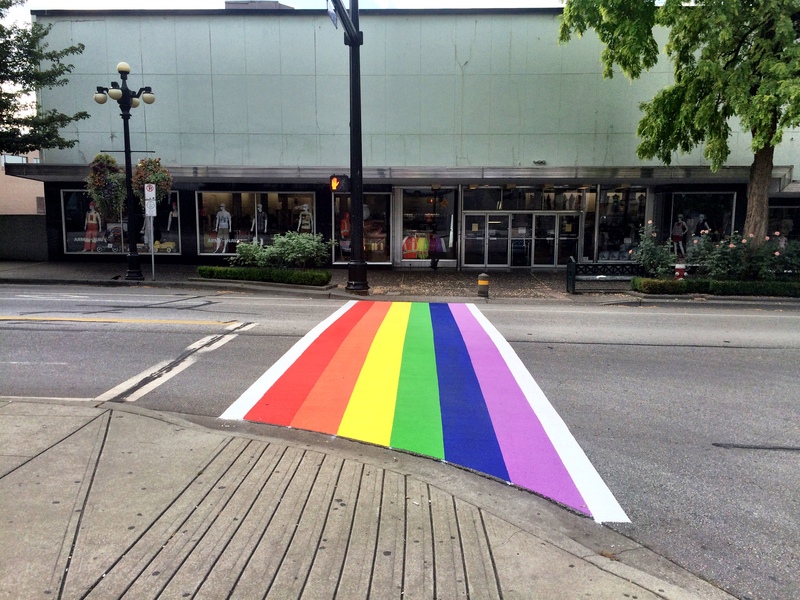 But I think the perfect place for a permanent Pride crosswalk in New West would be the pedestrian-controlled crossing at Columbia Street and Church Street. One, it would brighten up and bring back a little life to that end of downtown. Two, it’s right outside of The Heritage Grill, which has supported the gay community for a number of years, right outside the Steam1 gay bath house, and steps from The Met Bar & Grill, which is also highly supportive of Pride. So come on New Westminster, let’s gay up our city a bit!